Awesome Annie can also be booked as a Balloon Modeller, Face Painter or Glitter Artist separately. For any enquiries click the button below. 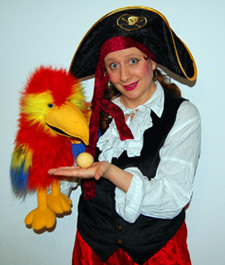 Awesome Annie is a fabulous friendly imaginative and skilful children's entertainer with over 15 years experience working with children. Annie performs a brilliant magic show, runs party games, brings a mini disco system with pop tunes / children's songs, lights and radio mic. Annie provides bubble fun with a machine and bubble gun. Annie is a face painter, offering glitter tattoos, and is a fantastic balloon modeller. With plenty of characters to suit children's tastes and also puppet friends, Annie has a great rapport with children of all ages including 2-9 year olds. Annie also offers musical instrument sessions and little puppet sessions for babies & toddlers! Other special requests may be catered for too, just ask. Video clips of an Awesome Annie Superhero Party! Provide balloon twisting! Your entertainer will transform colourful balloons into an animal, a sword, a flower or many more designs! ​Every child will receive a balloon to take home! You can also combine it with face painting, games, dancing, or other special requests can be catered for depending on expertise available. I will come to your home or venue, 30 minutes prior to the party start, to prepare. I will come dressed as a character to suit your theme.